Hello, friends! I promised something super special on Thursday morning and the day is finally here! 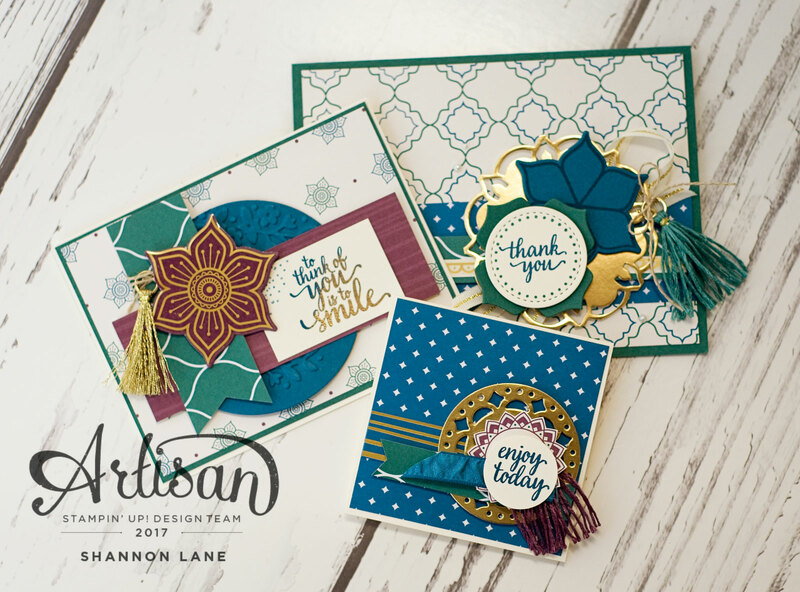 The Artisan Design Team is here today with a worldwide blog hop to launch a brand new Stampin' Up! product suite: Eastern Palace. You will absolutely LOVE the bold, rich colour combination, the detailed dies, and the beautiful embellishments. Are you a customer? You'll love this sneak peek of the Eastern Palace Suite. Exclusive for a limited time are the Starter and Premier Bundles, designed for both the beginning and avid crafters. And if you're a demonstrator? You can preorder the Eastern Palace Suite Starter and Premier Bundles from April 4th to 30th. Get your hands on these colourful and exotic products to prepare for the customer launch on May 1st! You'll find ordering information on the demonstrator website. How good are your eyes? If you're paying attention, you'll notice this sneak peek blog hop has THREE of the brand new 2017-2019 In Colours. I'm only sharing two of them on my blog - can you pick them out? It's not the Dapper Denim or the Gold... but don't they coordinate beautifully together? The richness of these colours is so lovely. 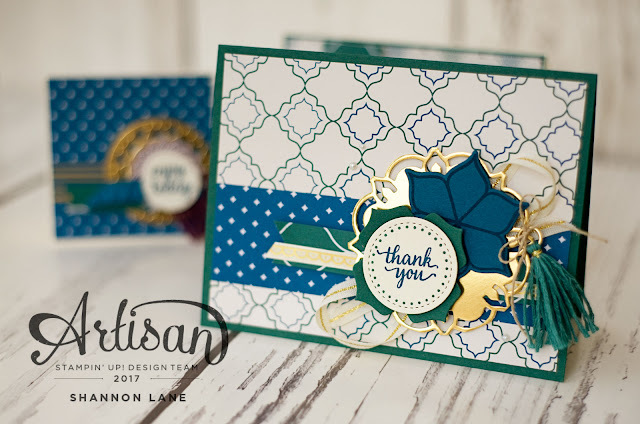 The beautiful tassels and gorgeous vinyl stickers add so much to an otherwise simple notecard. And while we're talking about fancy things... check out this fun little technique. Stamp with your colour of choice, and then add (VERY quickly!) some embossing powder to one side of the sentiment. 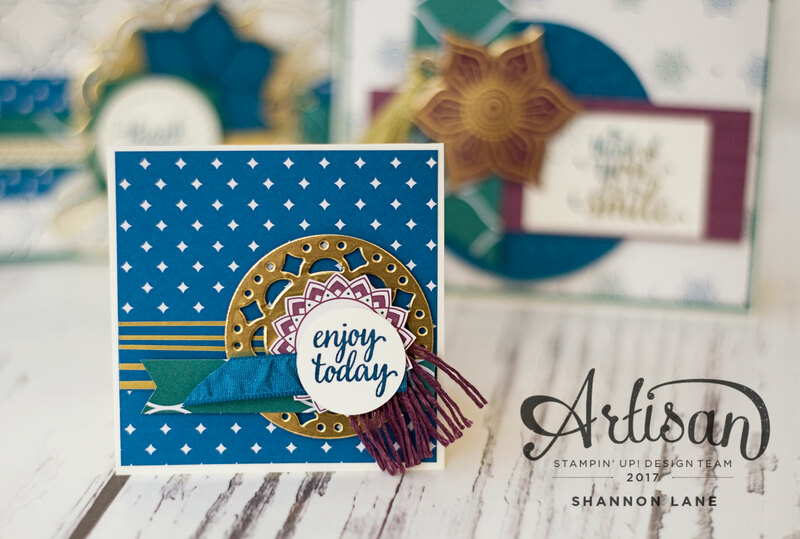 I've used Dapper Denim and Gold Embossing Powder. When you heat set, you'll get a two-tone effect. I hope you love this sneak peek; let's hop over to Sylwia in Germany so see even more of these beautiful products. I'll be sneaking a peek at the new catalogue in TWO DAYS - who else is excited for On Stage this weekend?! I am literally counting down the hours - I can't wait! Ohhhh the two tone embossing! Genius! Dear Shannon, all three are dream-beautiful! Shannon, you are so very talented. You never disappoint. I was on the fence about this suite but you have made me see I have to have it. I LOVE everything you do. Thank you for all the inspiration. 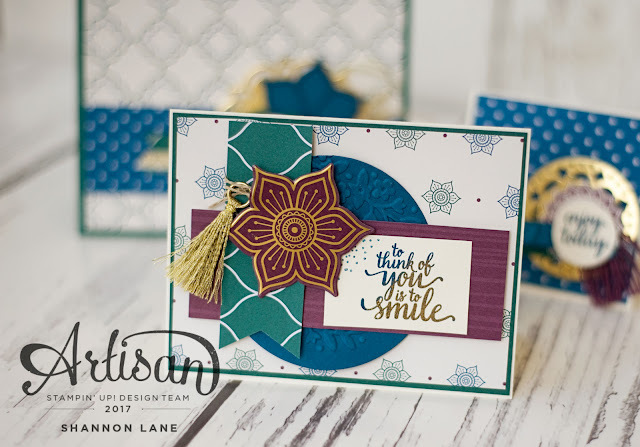 Beautiful set of cards Shannon! Love all of the texture you've used. I like the use of gold metallic paper for medallions. Especially the first card. Rising tide and Denim dandy ... I found the combination sad until then and now I want to dive in! It's awesome ! Wow, your cards are stunning!!! I am especially partial to the first (top) one, but all 3 are amazing! 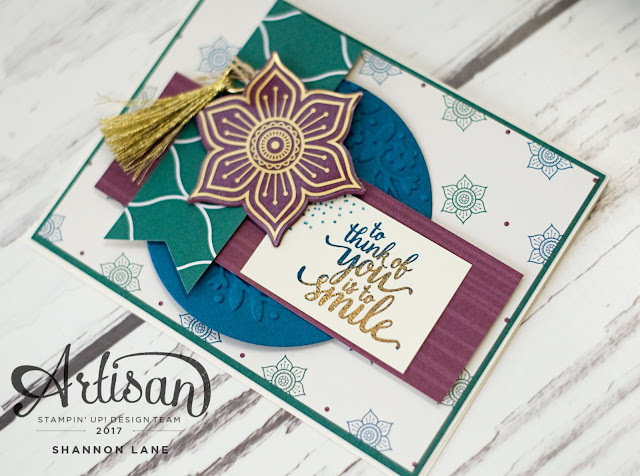 And what a fabulous tip to try out with the stamp and quick heat embossing to one side of the sentiment....that's a wonderful touch and I'll have to give it a shot! thank you!